My mom has wanted to build a labyrinth in our backyard for a long time. She first walked in a labyrinth many years ago in a park and really enjoyed the experience. From that moment on, the special process of walking a labyrinth was something that she had always wanted to recreate in her own home. My mom turned 60 this past November and as part of birthday celebration my family and I finally built a labyrinth in the backyard. We came up with a rope and steel stake system which was relatively low cost, easy to install and semi-permanent that looks and works great. What is a labyrinth and why would anyone walk in one? Simply put, a labyrinth is similar to a maze, however unlike a maze which has branches, a labyrinth is one single path, and as such, there are no wrong turns. A labyrinth's path is supposed to be easy to follow and is not constructed with the intention of making the participant feel confused or lost. Instead, one of the intended outcomes is quite the opposite, as labyrinths are used as meditation tools, to calm and focus the participant. Generally speaking, the labyrinth has a single opening, you walk in a back and forth pattern on the path until you reach the end. At the end, you turn around and walk out along the same path you came in on. It's pretty straight forward when you see this in person. Most labyrinths don't come with signs, or directions, they are "just there" for people to walk on and enjoy. Why someone would want to walk on a labyrinth is a simple question with many different answers. Labyrinths are found all over. Sometimes they have religious affiliations, others are simply just installed in a natural and beautiful setting like a park. Some walk them to feel a sense of calm, meditation and clarity, others probably just think of it as a fun path to stroll on. No matter why you may find yourself walking a labyrinth, it's generally agreed that labyrinths are beautiful and interesting creations. In short, labyrinths are built to be enjoyed, and that's certainly why we built ours. Wikipedia's labyrinth page has lots of interesting information on the history of labyrinths and their uses. While labyrinths warrant a more detailed explanation then what's offered here, this Instructable is more concerned with how to make one and assumes that if you are reading this, you've already got some interest in making one yourself, or at least learning how one is made, and can research more about the derivations and properties of labyrinths from other resources. The first step was to identify a labyrinth design that we liked. We chose to go with the fairly conventional design pictured above. This 7 circle concentric pattern with a straight forward entrance, simple pattern and non-bifurcating path spoke to my mother (and my dad and I were confident we could re-create it without much fuss - other labyrinth designs can get more complicated). My dad had the great idea of drawing grid lines over the design. That way we could scale up the drawing to something we could actually walk on...while my mom isn't a needy woman, she was expecting a labyrinth bigger then the 8 1/2" x 11" sheet of paper we printed the design on. With the grid lines drawn, a simple letter labeling system for the y axis and a number labeling system for the x axis, it was pretty easy to identify where the pattern crossed a grid line. We circled the easiest to spot intersections that occurred at whole value number/letter intersections and declared our first step of the design process complete. The next thing to consider was scale. We had a patch of the backyard in mind where we wanted the labyrinth to go that was roughly 20' x 20'. Some labyrinth's are bigger, some are smaller. Doing some testing with two pieces of 2 x 4, we identified that 16" was the narrowest path that still felt comfortable to walk on. Any smaller and you feel like you're on a bit of a balance beam. This defined a few parameters for us, the whole thing had to be within a 20' square, and the path couldn't be any less than 16". Luckily these two requirements work out just about perfectly with the design we chose. If you follow x axis line "G" across the drawing you can see that it crosses 15 boxes along the way from edge to edge of the labyrinth. With a path width of 16" that results in 240" in total width across the labyrinth, which is exactly 20'. Perfect! The next question we asked ourselves was what the heck should we build this thing out of? We have seen labyrinths that are built out of just about everything, from wood, to stone and rocks, earth, grass, vegetation, a flooring material, and even a cloth mat you can spread out on the floor. No one in my family was too enthused to dig up the backyard with shovels over Thanksgiving weekend, so we quickly vetoed the paver/stone idea - plus that stuff is expensive! We also didn't want to hire a professional with an earth mover, since that's also expensive and not very DIY. My parents live in New York, where the winters are cold and everything dies, so a "living labyrinth" was out too. To be honest, nothing that we'd seen before was quite right for what we wanted, and what's more, my parents are planning on moving in the near future, so we wanted to installation to be only semi-permanent, and ideally, movable to their next home. After some further consideration my dad suggested that we use a wide diameter rope to create the bounds of the path and some steel stakes to hold everything in place. This system is relatively cheap, semi-permanent and easy to work with. Wanting a natural look I suggested that we test with some wide diameter manilla rope. We quickly learned from the salesman that manilla rope on the ground will quickly rot. Luckily there is a landscaping product called "promanilla" or "unmanilla". It's made from polypropalyne instead of natural fiber like manilla is. To the eye, and even to the hand, it looks and feels just like natural manilla rope. It's completely static, doesn't leach, doesn't shrink, and won't rot when it sits on the ground and weathers the long wet New York winter. We ordered a few samples of the stuff in all the different sizes that it comes in, from 1/2" to 3". The bigger diameter stuff looks and feels great, but is unfortunately really expensive and so we compromised and went with a 1" diameter unmanilla rope that we bought online for around a buck a foot (prices vary depending on supplier - so poke around for good deals). 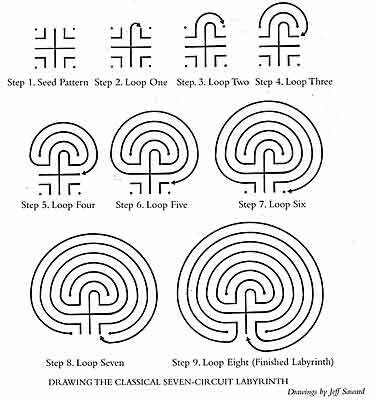 According to our calculations which we derived from adding the different circumferences of the 7 circles that make up the labyrinth which can be calculated from the graph paper, we estimated that we'd need between 225' and 250' of rope to construct the labyrinth. We ordered 300' of the stuff just to be safe as it would be hard to order more rope over the holiday week and we really wanted to have this ready for my mom's birthday which falls a few days after thanksgiving. A few days later the roll arrived in one giant piece. The rope needed some kind of a stake system to hold it in place. I can remember my dad saying "we need something like croquet wickets!". We settled on forming custom steel "J" shaped stakes out of 18" long 1/4" diameter steel rods. 1/4" steel rod is great stuff. It's thin enough to bend easily, but strong enough to actually build with - I love it. My dad found a steel yard on Long Island that was willing to not only sell us the 20' long 1/4" rods, but even cut them down for us into 18" long sections - awesome! I think we had around 250 rods cut thinking that staking the rope out every foot or so was sufficient. Rope can't move that much between two fixed points that are only 1' apart. Before building can begin we had to round up a few more things...our dog was not one of them, but she's in the picture above any way. The job requires lots of cheap twine, like 1000' or so, wooden stakes that we cut out of some old cedar shakes, some hammers to whack things into the ground with, paper and pens, tape, a big tape measure that can measure at least 20', miter box with hack saw, tape and lighter to seal the ends of the cut rope, a few extra copies of the plan from step 2, and lots of helpers. Luckily my sister and girlfriend were all around to help me and my parents build over Thanksgiving. Building a labyrinth is actually far easier and quicker than I ever would have thought. We finished the thing way ahead of schedule and once everything was all purchased and ready, it actually went together in a few short hours...broken up of course by our state mandated union lunch. The slowest and most complex portion of the build was figuring out a way to build a custom bender using only stuff from my dad's shop in the basement. If I were at my shop in California for this step, I would have welded some pegs onto a sheet of steel, thrown some square tubing on top of a 1" diameter rod and had a home made steel bender that would last a lifetime. In New York however my dad is more set up for wood working and so we had to work with the tools and supplies that he had on hand. The bender we came up with has a large double thick plywood base, some heavy duty 3/4" hardware forming the pivot point, and a long double thick plywood bending arm for leverage. I slid a short section of 1" diameter piece of pipe over the pivot point to ensure that the radius of the bend was 1" - the same diameter as the rope that the stake would later be hammered over. We used some scrap pieces of steel to form a stop block for the rods so they'd all be bent at the same location, and another piece of steel plate placed adjacent to the pivot point, exactly the width of steel rod away to hold everything in place during the bend. The lever arm has an old file cabinet drawer slide embedded in the bottom of it which rides along the smooth pre-finished plywood. The metal bracket slides along the wooden top surface of the base until it hits the steel rod. At this point, the bend begins. The lever is pulled on until it moves all the way around the pivot bolt and hits the stop on the far side. Then, we simply released pressure on the lever, backed it off a few inches and removed the perfectly bent steel rod. Once you get the hang of it, the process goes pretty quickly and I'd estimate that it only took about 15 seconds to bend each stake. After we built the bender, it was so much fun to use, that my mom really got a kick out of making the first few stakes. Before we actually started constructing the labyrinth we all went outside and stood around for a while looking at the plan and then down at the ground. I think this part was important, kind of a mental acknowledgment of "we're going to take what's on this piece of paper, and make it go on the ground, only much, much bigger". *note - we had already identified the area where we wanted to the labyrinth to go and had covered this spot in the backyard with mulch so that grass would not grow there. It previously was sort of muddy anyway and not good area for grass to grow anyway so it was a natural fit for the labyrinth. In any case, it's important to prep your ground surface to be however you want it before proceeding with the next step. When we were ready to accept our destiny, we measured out a 20' x 18' 8" perimeter box. This represents the area that the labyrinth will fit completely inside of. *note, according to our design, the labyrinth is one grid line (16" in the real world) shorter in height than it is in width, hence, we measured a box that's 20' x 18' 8" instead of 20' x 20'. Mark the four corners of this box. The labyrinth is now located in the real world. The next step is to string the perimeter with twine and mark the cord with a sharpie every 16" along all four sides. 16" goes into 20' and 18' 8" perfectly, so it the marks should be divided evenly on the respective sides. Hammer a wooden stake into the ground everywhere there is a mark. Try to hammer them deep so that the dog doesn't dig them out. Once all the stakes were hammered in along the perimeter, we used the twine to create a life-sized grid that was a scaled-up copy of what appeared on the paper. Tie a knot at one stake at the corner and pull it over to the next step. Instead of tying another knot at the other end we just wound it around the stake and kept going with the same piece of string...seemed faster at the time. Repeat for all the stakes to form the grid. With a 15 x 16 grid of string, it's easy to get a little lost on the coordinates if they're not marked. We wrote 15 numbers on one set of paper and the first 16 letters of the alphabet on another and taped the labels onto the two axises. Make the labels visible from the inside of the grid. Refer back to the design which you should have compulsively laminated by now and locate the points where the path of the labyrinth crosses a grid intersection. You can refer to those intersections via the numbers and letters on the axeses that correspond to that location. For example, I can say "C, 6" to refer to starting point of the entire labyrinth. Once I say that coordinate aloud, another person who is carrying the rope and some stakes can walk to that location and know that we're talking about the same location. This part is a little like bingo. Start with the very first point, there are two to choose from, we called out "C,6". My mom then walked to that location on the grid and hammered in the first stake at the very end of the coil of rope. This is the first stake in the labyrinth, there will be many more. Get a feel for how this whole process works, and be ready to repeat. While looking at the diagram, follow the path of the labyrinth and call out the next intersection. It's best if there are two teams of two awaiting your calls and working to hammer in the stakes. Each team leap frogs the other as they work their way down the rope and hammer in more and more stakes locating the rope in the proper position to form the labyrinth. Not all points that are called out have to cross perfectly at an intersection. We got pretty used to saying something like "7, just shy of N", which would indicate that the rope should fall perfectly on the 7 grid line but not quite all the way to N from M. You can of course come up with you own language for this to include things like, "a little more than", "just shy of", "half way to", "a hair more then" etc, etc etc. The labyrinth is actually made up of two separate lengths of rope. When you get to the endpoint of the first piece, mark that location on the rope and then cut the rope using a hack saw and a miter box. The rope cuts very quickly. We taped the cut end and then used a lighter to fuse the fibers together so it didn't unravel. Repeat the entire process for the second piece of rope that makes up the labyrinth so that the basic shape of the whole thing is now in place. Whoa - it really starts to take form! As you uncoil the rope from it's box, spool or coil it's bound to have some twists in it. Wanting to lay down unkinked and as straight rope as possible, we simply rolled the box in one direction or another to work out the twists. Rolling a box around the ground that's filled with 300' of 1" diameter rope though is hard work! We quickly discovered that putting the box of rope on a desk chair and spinning the chair around in circles was an effortless solution to getting rid of the twists. Make sure that you've hammered in stakes at all the major points and intersections so you've got the basic shape represented. Next, send in the detail team. Kelley and I worked together to start at one end of the rope and massage out any lumps or bunches. We also made sure that the rope had a nice curve between any two given points so it looked nice and even. Changes can be made by either giving, or taking slack at any point. If there was ever a section that needed a little adjustment, we simply hammered in another stake locating the rope exactly where we wanted it. With a little focused work, it's pretty easy to smooth out all the curves and distribute the rope evenly throughout the entire labyrinth. This step is where the project went from "looking pretty good" to "looking great"! With all of the rope correctly located in place, there's no longer any need for the grid lines. Using a scissors, cut the grid at many locations and begin pulling out the twine. The twine slips out from underneath the stakes easily and should not disturb the rope's position. The final step is to make the maiden voyage/walk on the labyrinth. My mom went first of course since it was her birthday present. She really enjoyed it and was really excited about how it turned out! The next day we realized that we wanted to walk it at night, and so we strung up some tasteful christmas lights in the backyard above the labyrinth from the tree branches and lit everything up. It actually looks really cool at night and is a very peaceful time to be out in the backyard. I can't say that I feel any immediate effects from walking the labyrinth other than it simply being a pleasant way to spend time walking outdoors - two things that feel good to me anyway, but I can say that it was a whole lot of fun to have the opportunity to make something that involved my whole family working together and that I'd definitely recommend the rope and steel construction method we pioneered in this project to anyone looking for a low(ish) cost, semi-permanent, DIY Labyrinth solution. This is an excellent option...especially for a NY backyard. It's a great an inexpensive idea. I have a small yard and am thinking of making a 3-circuit one. Thanks for the instructions and idea. how much space do you need for the 5 circuit? Wonderful! I've done a larger-scale version of this for a library Renaissance Faire. You did a great job. When your folks move and you're ready to put it up in a new location, you might reconsider the layong-out process. Most of the labyrinth is made of successive arcs around a few pivot points. You can use twine anchored at those points to serve as a compass, and pre-place your stakes at regular intervals along the path. Once all the stakes are placed, you can then lay the rope out in two passes. That is awesome! Do you have instructions for that? I'd like to see if possible. LOL, I was going to suggest that too . I've made two stone labyrinths and the string method is much easier than this , it did turn out great though . Wow, thanks for that, yoyology! I've helped lay out a few labyrinths and while we ended up with the right design, it was never quite as simple as that diagram! Someday, when I don't live in an apartment, I will have a backyard labyrinth. You can actually create any size classical labyrinth starting from that basic seed pattern. The one I linked to is a 5-unit square seed, which makes a 7-circuit labyrinth. Go up to a 7-unit square, and you get 11 circuits. Also, if you make curves instead of right angles inside the seed square, you get an open diamond in the middle (see image). If you delete the upper right curve of that diamond, the center of your labyrinth becomes a larger open space, good for meditating and for more room to turn around before heading out. I like this instructable a lot! I am currently a landscape architecture student and one of my professors, Kent Schute, is a specialist in labyrinths. he has recreated the one in chart cathedral and went into great detail about them for us and showed us several different forms of them, this being one of them. I guess what I wanted to say is well done!! That would be cool to get simple instructions to do it. Do you have any other suggestions other than what we see here? Fantastic!!! I can't wait to make one!!! And by that I mean have my hubby make me one!! You folks are awesome. Thank you so much for sharing this. i like this a lot, but i was wondering, if a labyrinth had one path, why didn't the minotaur just walk out? and why did theseus need a string? sorry i am always nit-pivking little things, also when i read books. what you made is really cool! I have been planning constructing a labyrinth in my backyard for TWO years now. I have found the idea sooo complicated. You have actually showed me it can be done fairly simply and inexpensively.The diagram and staking it out is what makes it "handle-able" And so very cool looking! Congratulations and blessings to all! Your family did a marvelous job on this labyrinth. I have friends who laid one in their back yard in brick. It was very nice and peaceful, but it lacked the professionalism that yours shows. Congratulations! Fantastic! I love labyrinths! Your use of the rope is an excellent idea. I've been thinking about how to put one in my backyard and I hadn't thought of rope. I have some old bricks lying around and I thought I'd half bury them to make the borders, but rope looks to be a lot easier. Instead of a grid, did you consider using a compass method? I've read about people doing temporary masking tape labyrinths that way. Stake the middle and have a rope going from it to your outside radius. The rope is marked where every circuit's line would be. One person walks on the outside holding the rope, and people on the inside mark the circles. The curves and straightaways are created after. Here's a link that explains it more thoroughly: http://www.labyrinth-enterprises.com/tapemachine.html I'm not sure which method is less labor intensive. The ropes are so low profile, I bet you could go over them with a lawn mower without any damage at all. This is really kool, also enjoyed reading about "Labyriths"